Salon de Co’s signature dish: Mareema Tea Smoked Duck. 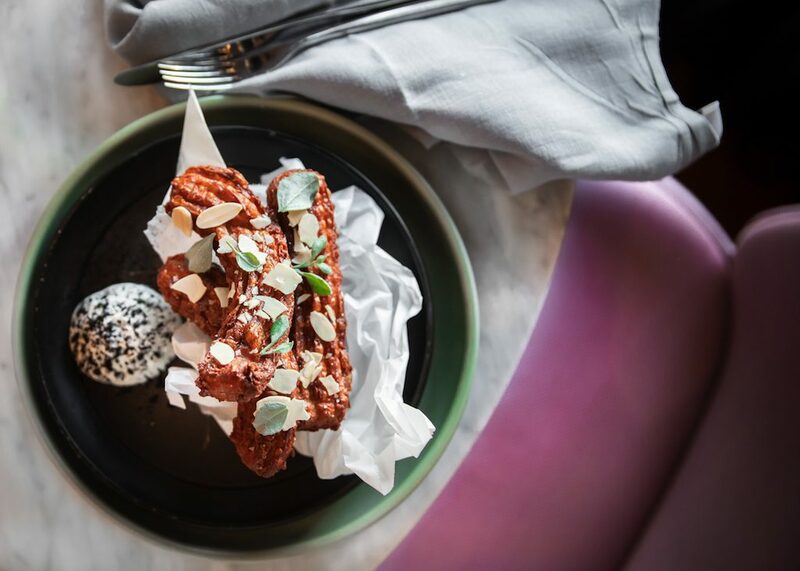 There’s something about the food being served at boutique Brisbane hotel, Ovolo Inchcolm, that fits in beautifully with the style of the hotel. The spectacular dishes being produced by the hotel’s new head chef, Andy Ashby, are rooted in the classics and tradition yet have a playful, modern edge. The same could also be said of the hotel, which is located in a 1930s heritage building with a quirky and joyful interior design. 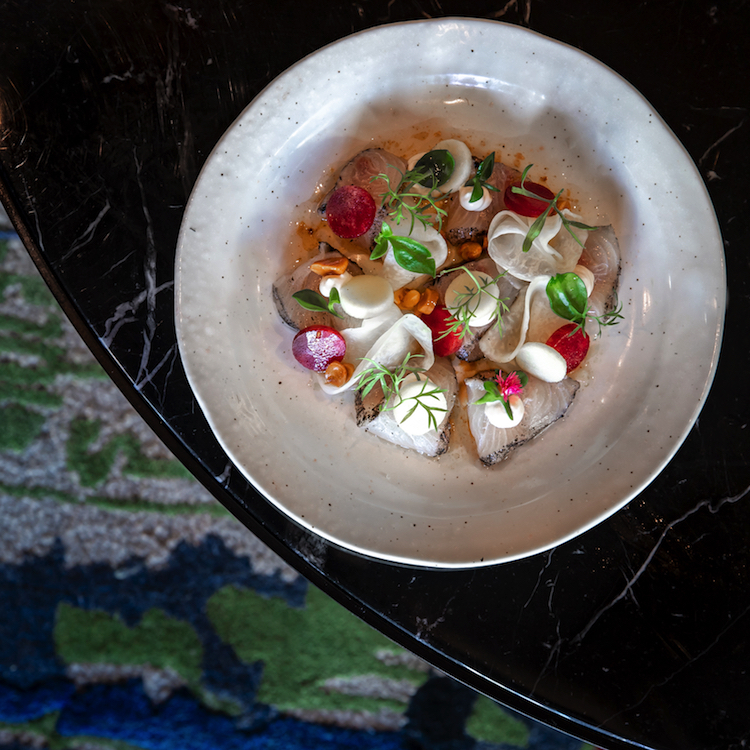 Ashby’s food is right at home in the Art Deco-style Salon de Co, the Inchcolm’s intimate and eclectic 30-seat restaurant. His most recent gig was at Sydney’s acclaimed nel. Restaurant, and prior to that he worked in a number of renowned restaurants including Point in Melbourne, Qualia in Hamilton Island, and Thompson Reserve in Brisbane. The Salon de Co bar reflects the Inchcolm’s heritage/eclectic style. At the Inchcolm he has collaborated with Ovolo Hotels’ creative culinary partner, Ian Curley, in designing a menu that incorporates flavours and seasonal ingredients from Australia and abroad. Guests can choose between à la carte and tasting menu options, and there’ll be a high tea menu introduced in the next few weeks. 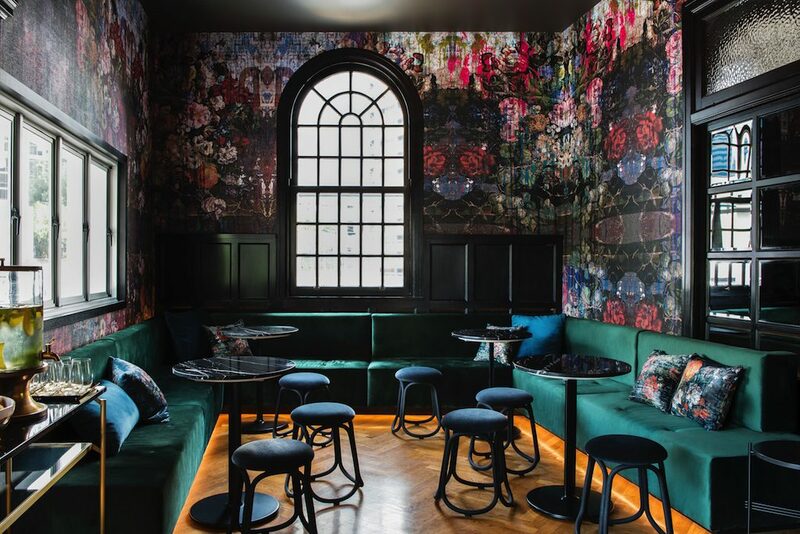 Curley, who owns and operates French Saloon in Melbourne, is overseeing the direction and menu development at both Salon de Co, and Monster Kitchen + Bar in Ovolo’s Canberra hotel (formerly Hotel Hotel). 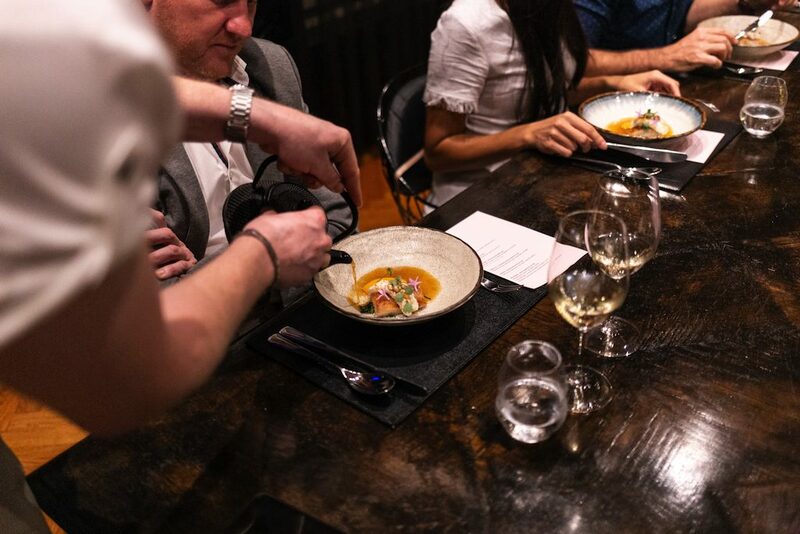 There’s a definite and intentional Queensland slant on the Salon de Co menu, with produce such as Queensland spanner crab, Mountt Tamborine scampi, Daintree chocolate, and even camel milk fromage, a cheese from Summer Land Queensland, incorporated in the dishes. Salt and vinegar churros filled with camel milk cheese. We had a taste of the new menu this week and were super-impressed with all the dishes we tasted, from start to finish. The six courses we experienced were matched with four wines and a specially created cocktail, and I was surprised to learn that Ashby had chosen the wines himself. This shouldn’t have been surprising but it was, because so often chefs play no part in the wine matching, confining their expertise to the kitchen and leaving the drinks to the wine experts. Yet the food and the wine are integral to each other’s success, and chefs, with their finely honed palates, have a distinct advantage in working out what goes with what. Hurtle, a crisp and refreshing sparkling wine from Adelaide Hills’ O’Leary Walker, was poured with the appetisers: Queensland spanner crab with burnt butter and macadamia; dainty little salt and vinegar churros filled with camel milk cheese; and rabbit and cauliflower ‘popcorn’. The ‘popcorn’ is one of the Inchcolm’s bar snacks and Ashby describes it as a “bit of a lucky dip … you don’t know if you’re getting rabbit or cauliflower”. 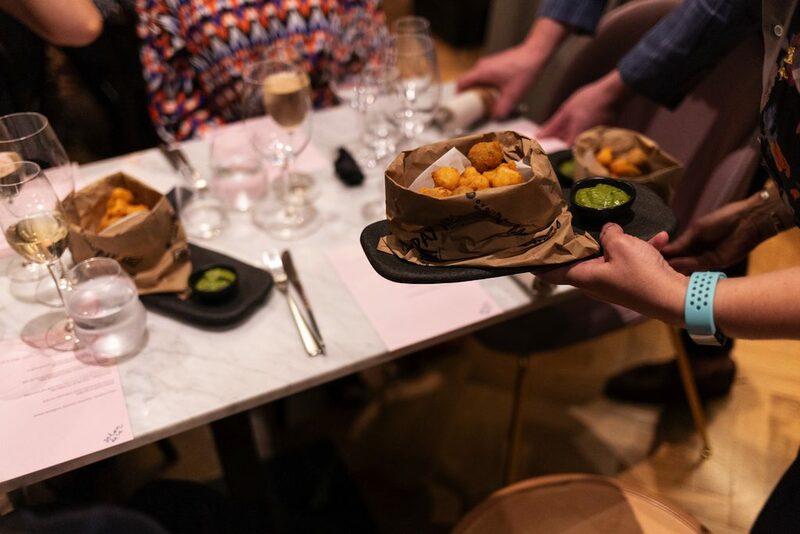 Served in cute paper bags, each of the little popcorn-shaped morsels is deep-fried and equally delicious. The next wine, 2017 Derwent Estate Riesling from Tasmania, was absolutely stunning and beautifully matched with an entrée of kingfish gravlax. The next course, barbecued scampi on pork belly with a dollop of pumpkin puree on the side, was paired with 2016 Tarrawarra Estate Chardonnay from the Yarra Valley, always a personal favourite. 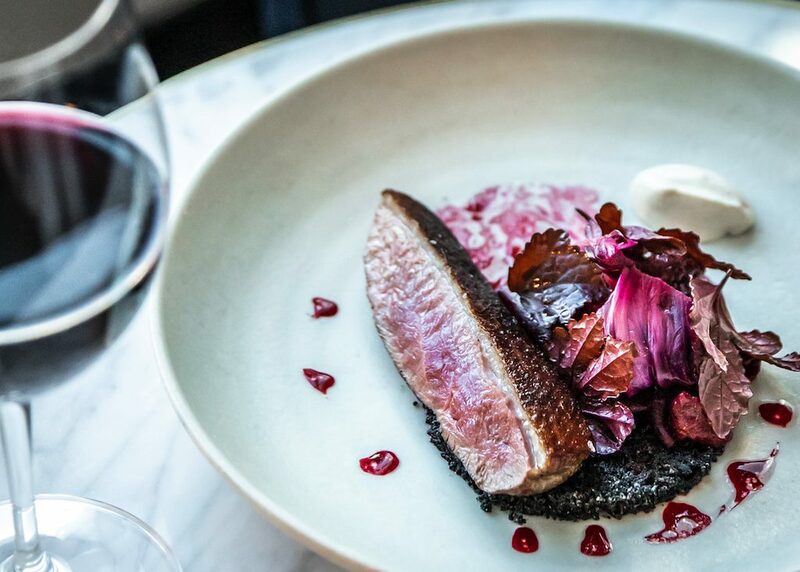 We can’t rave highly enough about the main course, a duck dish which is one of the signature dishes on Salon de Co’s autumn menu. Kingfish gravlax, paired with a beautiful Tasmanian Riesling. The duck was served with beetroot and rosella, and with another beautiful wine, 2017 Alpha Box & Dice Siren. It’s great to see the hotel supporting interesting small producers like this McLaren Vale winery, and especially varieties like this Sicilian one, Nero d’Avola, that many consumers are unfamiliar with. Broth poured at the table, over pork belly topped with scampi. 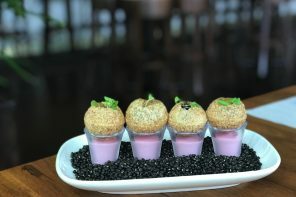 The hotel created a cocktail of rum with lemongrass, mint, elderflower and citrus to go with the autumn-inspired dessert of feijoa with white and coconut. (I suspect Ashby is showing his New Zealand origins with the choice of feijoa for dessert.) And finally there was a great surprise in the treat that came after it, described as an Aussie lamington with Daintree chocolate and Davidson plum. I’m not going to reveal the surprise here, and even the photo is unlikely to give you a clue. You’ll just have to pop along to Salon de Co to find out what it’s like. Christine and Maurie dined as guests of the Ovolo Inchcolm hotel. All photos supplied by The Cru Media and used with their permission.